Online Music Store Will Amazon Ban Me If I Return Too Many Items? With more than 200 million products for sale, Amazon store is the biggest online retailer in the world. You can find virtually anything that you could need or want at the online marketplace, and many people find that they don’t have to shop anywhere else because Amazon has such great prices and so vast an inventory of products. The site is also dedicated to ensuring customer satisfaction and has a return policy to protect buyers; however, there are times when returning items can get you into trouble. 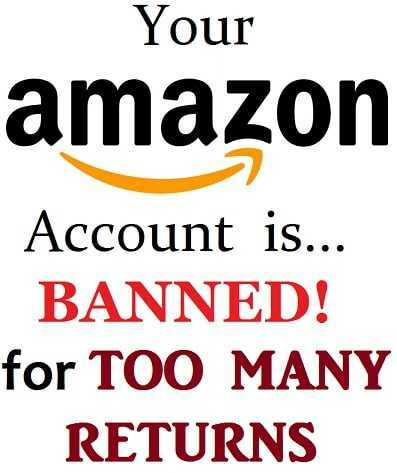 Read on to learn more about bans from the Amazon store due to returns. Amazon offers a return policy on nearly all of the products that are available for purchase on the site regardless of whether they are sold by Amazon or by a third-party seller. In order to qualify for a return, buyers must usually send the merchandise back within 30 days of when they received it; however, some merchants have longer return policies in place. During the holiday season, Amazon provides a more flexible return window to allow for gift shopping. Items purchases from November 1 to December 31 in one year can be returned as late as January 31 of the next calendar year. To start a return, buyers use an online system that allows them to print a label to attach to the box. Typically, refunds are provided within 2 to 3 weeks. The Amazon store return policy is designed to allow buyers to shop with confidence, knowing that they won’t be charged for merchandise that they can’t use or that can’t meet their expectations. Amazon does not penalize people for using the return policy periodically, but when people begin to return many items, Amazon does seem to take notice. People who are thought to be abusing the return policy by purchasing items, using them and then returning them could end up being banned from Amazon. There is no hard and fast rule as to how many returns would warrant a ban. The team at the Amazon store decides on a case-by-case basis, assessing the actions of buyers individually. Obviously, the best thing that you can do to avoid being banned from the Amazon store for returns is to limit how much you return. In particular, try to avoid returning many items at one time. If you do end up having to return numerous items at once or you realize that you have made many returns, contact the customer service team and explain the reasons why. Being proactive and alerting Amazon as to the reason for your returns can go a long way toward protecting your account. The good news is that if you are banned from Amazon for an excessive number of returns, it is sometimes possible to get your account reinstated. The best thing to do is to contact the Amazon store customer service team (Toll Free Number – 1800 3000 9009) and explain your case. You can also get in touch with Amazon Help, at their Twitter Handle, rest assured, you’ll get a positive response within a few minutes.